This pasta is made for us in the hillside town of Gragnano, near Naples, by a business which has been making pasta since 1789. Gragnano is thought to be the birthplace of dried pasta, and the main street was laid out expressly to capture the mountain breezes, mixed with sea air, which dried the pasta hung on drying rods outside.The town is still renowned for its pasta, and has been granted IGP status (Protected Geographical Indication). The pasta is pressed through traditional bronze dies, creating a slightly roughened texture that helps sauces to cling, and although it's no longer hung outside, it's still slowly dried at low temperatures, giving it a nutty aroma and slightly chewier texture that soaks up the flavour of a sauce. 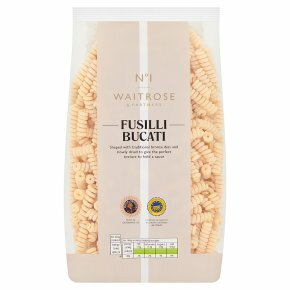 Fusilli bucati was traditionally made by wrapping the pasta dough around a knitting needle. The spiral is hollow, which gives the pasta a good 'bite'. A versatile shape that goes with many types of sauce, its also a good shape to add to salads.